Fall migration has come to an end, and we have now tallied up our findings from this autumn’s Project Safe Flight efforts. In all, a total of 78 dead and injured birds were found by our dedicated Project Safe Flight volunteers this fall, who go out every week during migration rain or shine to help us determine where birds are colliding with glass around the City. Monitoring took place at several sites this fall, including the Metropolitan Museum of Art (MET), Bryant Park, and the Richard Meier building on Prospect Park. Several new sites were monitored this year as well, such as Lerner Hall on Columbia University’s campus and the Ford Foundation Building. 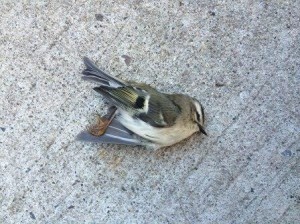 The MET and Bryant Park continue to be collision hotspots for migrating birds. Even with fencing obstructing parts of the route at the MET for the first few weeks of migration, our volunteers still found 50 birds there over the course of 10 weeks.